In the 2nd half of February, the European Space Agency will launch the first of its Automated Transfer Vehicles (ATV), “Jules Verne”. 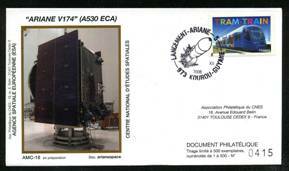 “Jules Verne” will be launched on an Ariane V rocket from the launch base at Kourou in French Guyana. The spacecraft will complement the Russian Progress as a freighter to the International Space Station. Local servicer and stamp dealer. 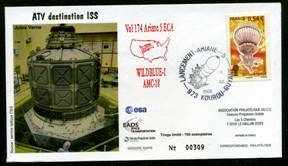 Provides rubber stamp cachets on appropriately stamped and addressed covers. No fee. May take long. 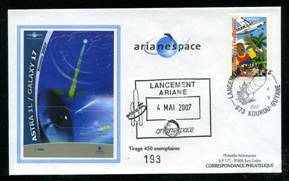 Stamp club of Ariane’s mother company, Arianespace. 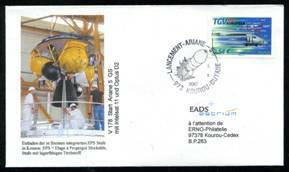 French space agency CNES. Note that Toulouse maintains the control center for ATV. Formerly called SEP, the company produces the solid combustibles for Ariane. Club membership required (annuel fee €9), covers are €2.70 ea. French stamp dealer located in the building of the European Parliament at Strasbourg. 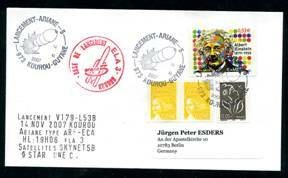 Offers nicely illustrated cacheted covers at €6 ea. French space dealer. Ariane covers are €5 ea.